This weekend will mark several clubs beginning their activities to commemorate of Remembrance Sunday, which is on 13 November this year. At Sunderland, who lost their goalkeeper L.R. 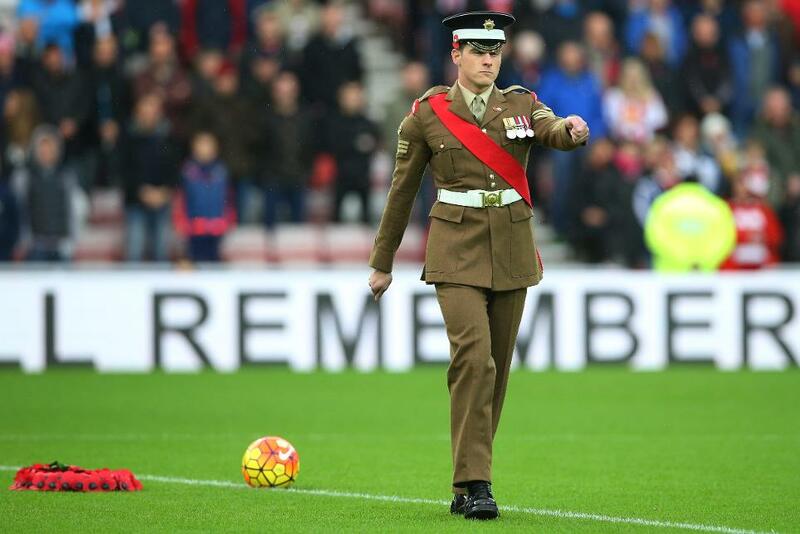 Roose in the Battle of the Somme 100 years ago, soldiers from the Household Division based at nearby ITC Catterick will parade round the Stadium of Light pitch before the match against Arsenal and will form a guard of honour as both teams take to the field before a minute's silence. At White Hart Lane, as well as the Poppy Wall outside the stadium, Corporal Andrew Lofthouse, a Trumpeter of the Central Band of the Royal Air Force, will play the Last Post during the minute's silence ahead of the match between Tottenham Hotspur and Leicester City. To start their remembrance, Spurs' Mousa Dembele visited Tottenham Cemetery this month with local schoolchildren for the War Graves' Commission's Living Memory project. On Sunday, at Everton's match with West Ham United, tributes will include commemorating James Alex Thomas, a 15-year-old Evertonian killed at the Somme. West Bromwich Albion are among the clubs whose special shirts with poppies at home to Manchester City tomorrow, as well as the trip to Leicester City the next week, will be auctioned off for the the Royal British Legion (RBL). Southampton's players will also have poppies on their shirts ahead of their home match with Chelsea, ahead of which a minute's silence will also be observed. There will be similar messages of support and fund-raising for the Royal British Legion at Watford ahead of their match with Hull City. The funds raised by the Premier League and its clubs are set to exceed £1million for the Legion this season since the support started in 2012. "We are extremely grateful for the support the Premier League clubs and football community show the Poppy Appeal year on year," the Royal British Legion’s Director of Fundraising, Claire Rowcliffe, said. Throughout the campaign, clubs also support Tickets for Troops, the military charity that supplies free tickets to members of the Armed Forces in recognition of the work they do on our behalf. In 2015/16, more than 30,000 tickets were supplied to Tickets for Troops. See: What is the Poppy Appeal?